Steve Scalise is either too dumb to be Republican Whip, or just plain lying about his association with David Duke's despicable racist organization, because none of what he has said about his association with Kenneth Knight, a leader of Duke's racist group has made the least bit of sense to anyone with even a low voltage BS detector. 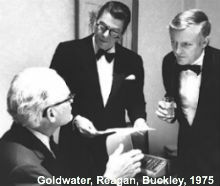 An original conservative general looks at the GOP, and conservatives’ place in it, from Goldwater on. To win the elections necessary to govern America according to conservative principles there’s only one way to go; recruit the candidates and do the work necessary to obtain the Republican nomination for conservatives. Just as importantly, conservatives must get involved in the Republican Party at the precinct level, run for Party office and takeover the GOP at the local, state and national levels.